A private resort experience for two couples that want to travel and gather together, yet retreat to their own spaces to unwind after a day of wine tasting, touring, dining out or socializing by the pool. Sonoma Rosso is located on the Highway 12 Wine Trail in beautiful Kenwood, in California's Sonoma Valley, approximately one hour north of San Francisco. The scenery is gorgeous - from vineyards and wide open fields studded with ancient oaks to rolling hills and dramatic mountains. The property has an historic stone ranch house, two cottages and an art studio. There is an organic garden, large saltwater pool and other amenities for our guests to enjoy in season. Sonoma Rosso now features two fully outfitted cottages, the Guest Cottage and the Creekside Cottage. When rented in combination, it is a luxury residential experience for two couples that want to travel and gather together, yet retreat to their own completely private spaces. Each cottage has a living room, full kitchen, and bedroom with en-suite bath. If you are looking for a 2-person stay in one of the cottages, please send an inquiry for pricing and availability. The Guest Cottage is a 624 sq. ft. poolside cottage built in 2014. It has a private patio with a gas grill and seating for two. The living room has a 42-inch screen SMART TV with premium channels. The eat-in kitchen has all new appliances – range, microwave, and refrigerator. The bedroom is a peaceful retreat with a queen-size pillow-top bed, with luxury cotton sheets, your choice of pillows, blanket and duvet. Individual nightstands with reading lamps and storage drawers have built-in USB chargers for your phone or tablet. There is a vanity table, full-length mirror and closet. The en-suite bath features a deep soaking tub and shower combination. The handheld shower has adjustable jets. The Creekside Cottage is an 860 sq. ft. home with a separate driveway and entrance from a private creekside patio with outdoor seating. Glass double doors open to the shared pool area. The open-plan great room has a spacious seating area with a 50-inch SMART TV with basic and streaming channel options and dining area for 4. The kitchen has full-size refrigerator, electric range/oven and microwave oven and an island for extra prep space. The large, separate bedroom has a sitting area and a queen-sized bed in alcove, with individual nightstands with reading lamps. We provide luxury cotton sheets, duvets, extra pillows and blankets. There are large closets and an en-suite bath with a tub-shower combination. Each cottage has a kitchen that is fully outfitted with new cookware, dishes, glassware, flatware and utensils. The cabinets are filled with kitchen basics. If you would like us to pre-shop for groceries, we can make arrangements with you prior to your arrival. Spa robes and pool towels are provided – you’ll want to pack slippers or beach sandals for walking on the gravel path to the pool. Each bath has shower gel, shampoo and conditioner and a hairdryer. We are typically on the property in the main house and will greet you and show you around. The grounds of the property are a shared space. There is a laundry room available on the property. There are more than two dozen wineries and tasting rooms nearby, including St. Francis, Chateau St. Jean, VJB, Ty Caton, Landmark, Kenwood, Kunde, and Ledson. There are many notable restaurants a short drive from the property and three Michelin star restaurants in Sonoma County. We are located 13 miles north of Sonoma Plaza and 5 miles south of the Calistoga Road which leads over the hill to Napa Valley. We are a fully permitted vacation rental. Sonoma County TOT #1402N and we collect a Sonoma County Tourism Tax of 12%. A cleaning fee of $100 is charged per visit. Daily housekeeping is not included. If you are staying longer than a week, we will provide a clean set of bed linen and towels. During the high season (May - October) there is a two week maximum stay. Cell phone service seems good with most carriers. There is a landline phone in the Guest Cottage available for domestic calling within U.S.
Each cottage is two-person occupancy. Minimum guest age is 25. Sorry, we do not allow children or pets. No smoking or vaping is allowed inside or outside. No drugs. Only guests in booking party are permitted on property: no parties, no loud music. County regulation: Quiet hours 10 p.m. to 9 a.m. Please do not use indoor furniture, plates or glassware on the pool patio. There are shatterproof glasses and plates for use outdoors. The property has a well water and uses a septic system that requires following simple rules that are posted. We are long-time San Francisco Bay Area residents who love to share this beautiful place with visitors. We are happy to recommend our favorites and new discoveries with you! Sonoma Rosso is in an ideal perfect location for exploring wine country and more. We are close to state and regional parks with hiking and beautiful vistas, great wineries and restaurants. Easy access to Sonoma, Napa, Santa Rosa, Healdsburg and the coast. One hour from San Francisco. The property looks onto Hood Mountain and Sugarloaf Ridge and has amazing sunsets and moonrises - Sonoma Valley is also known as The Valley of The Moon. Cottage decor features new, custom, antique and one-of-a-kind pieces. We want you to feel at home, and have provisioned the cottages with everything you might need for your Sonoma vacation. We've stayed in wonderful vacation rentals and have taken notes! Both bathrooms have under-sink storage cabinets and combination tub/showers. The Guest Cottage is new, with a deep soaking tub with Italian porcelain tile surround. Property faces Hood Mountain and Sugarloaf Ridge. Sheets; 3 types of pillows: memory foam, down alternative and down; Light and heavy-weight duvet depending on season; Extra plush blanket. Laundry room on property, but not in unit. Laundry room in property, but not in unit. Creekside Cottage parking is very close to unit. Guest Cottage parking is farther away on property but wagon is provided for luggage. Individual networks in each cottage. Coffee, tea, sugar. Basic condiments and spices. Paper towels and napkins. Guest Cottage: In addition to indoor dining area that seats 2, there is a patio for 2 with gas grill, umbrella, table and chairs for your private use. Creekside Cottage: indoor dining area seats 4. There is a public golf course within 5 miles of the property. Enjoy our large, saltwater pool while you are guests at the cottage. The pool is private to the property but shared with owners/guests. It is seasonally warm - usually May through October. Please let us know in advance if you want recommendations for wine tours, restaurants, spa appointments, etc. We stayed with another couple in the two back cottages. The space was great. Our flight was delayed and we got in late and Linda was very accommodating. I would love to stay again. Very nice and quiet, privacy was very important to me and this place was great, we were there for 8 days. Owners residence is on the other side of the pool, never saw them the whole time, there is one other cottage on site, but the outdoor areas for the two cottages are completely separated and on opposite sides of the property. House itself is very nice, it heats up very quickly, all appliances work, only thing it lacks is a dishwasher. There is an onsite washer and dryer with provided detergent. Owner provided new towels when requested. Cottage has staple food items and utensils. The owner let us pick some fruit from the fruit trees which was nice. Also has a grill, but didn't use due to the weather. Cottage has TV, wifi, various games and books. Was very comfortable. Owner was very responsive to my text messages. Will definitely stay again, I'm sure I left some stuff out, cannot say enough good things. We are glad you had a good stay! We value our guests privacy, and are always available if needed. When both cottages are occupied (often by couples traveling together) the pool area is a shared space and all guests have access to the gardens, as well as their private patios with grills. We'd be delighted to host you again! Sonoma Rosso was a wonderful home-away-from-home during our recent wine tasting getaway. Perfectly situated for two couples, each cottage was comfortable, clean, well appointed and tastefully decorated. 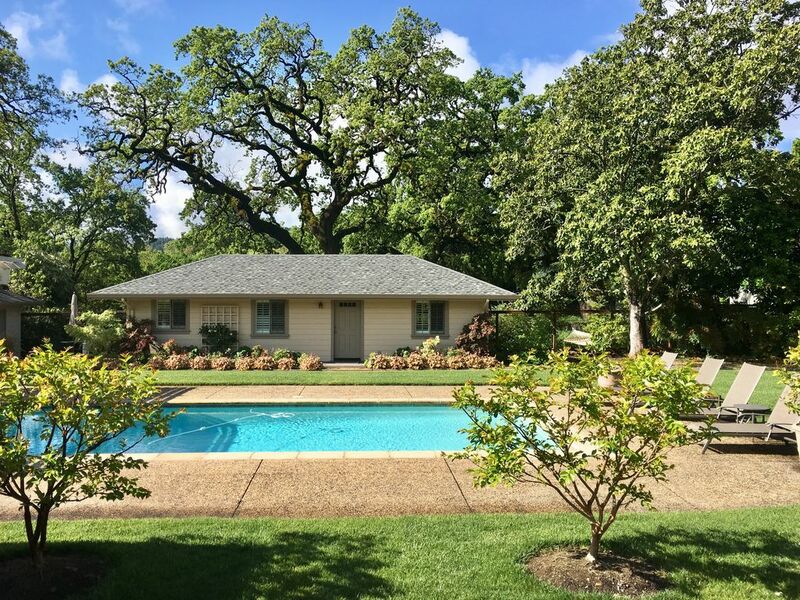 While situated on one of the main Sonoma roadways, the cottages are nestled well off the road behind the main house and next to a delightful, babbling brook. Sonoma Rosso is also convenient to several wonderful local restaurants and a short and scenic drive to the wineries of both Sonoma and Napa. The property owner, Linda, was a gracious hostess, who was always available to answer any questions. We look forward to returning to Sonoma Rosso on all of our future wine country vacations. The best VRBO we have ever stayed at! When we vacation we typically stay at a VRBO property. This was by far the most well maintained property that we have ever stayed at. Linda and Michael have thought of everything. There are breakfast items in the refrigerator for your 1st breakfast, a cooler, cold packs, a picnic basket, menus, coupons, shampoo/conditioner and even robes! The location is centrally located and you can get to any part of Sonoma/Napa or the coast in less than an hours. There are great wineries for tasting and restaurants near by. If you like to drink red Zin, we highly recommend St. Anne's Crossing for a tasting. My husband and I had the most wonderful stay at Sonoma Rosso. It was such a warm,inviting, and comfortable place that we hated to leave. The house had everything we could have needed. Everything was labeled and easy to find. The kitchen was stocked with dishes and everything we would need for cooking including a BBQ grill. There were two choices for making coffee! There was a picnic basket, blanket, and chairs. Everything about the house was comfortable, super clean, and very welcoming. We didn't use the pool but are sure it was equally great. The garden and grounds are lovely. Linda recommended the food and wine pairing at St. Frances winery (a short distance away). That was fabulous. We loved everything about it! Make a reservation early! This location is great for seeing Sonoma and also going further north to Healdsburg and that area. Napa is also easily reached. There were also great restaurants to choose from within 5-15 min. I really can't say enough good things about this place. Linda answered my messaging very quickly and made the whole process work perfectly. We could see that she and Michael put a lot of heart into making this a wonderful place to stay. We will be back next year and will, of course, base our dates on when Sonoma Rosso is available! Please let us know if anything needs repair or replacement on your departure. We want to make sure the next guests receive all amenities and conveniences, and find everything in working order.